the cinderella project: because every girl deserves a happily ever after: Are you going to The Most Ridiculous Wedding Event Ever? Are you going to The Most Ridiculous Wedding Event Ever? One of the reasons I got into the wedding industry? Mindy Weiss! 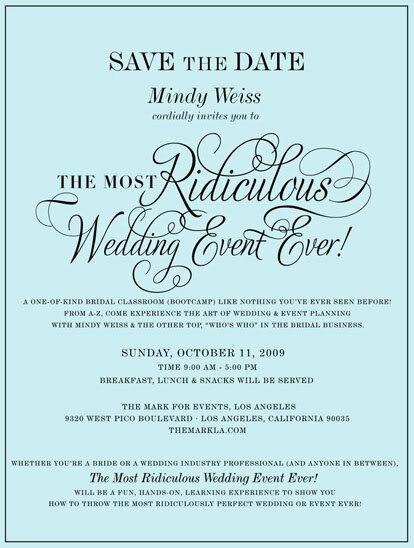 Save the date for this Sunday, October 11, 2009 for an event to remember, hosted by the one, the only, Mindy Weiss! For more information, head on over to Mindy Weiss for all the details!